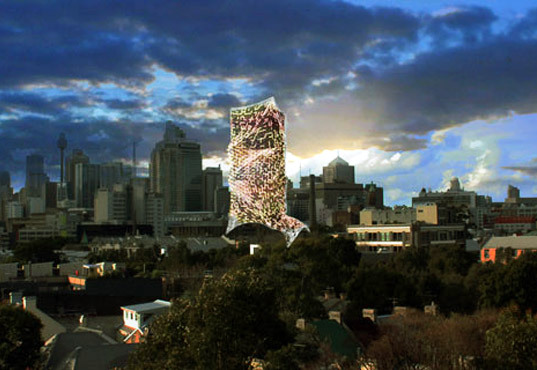 Inhabitat has a post on a conceptual design to make Sydney's ugliest building a little more attractive - Solar Building Skin Turns Sydney’s Ugliest Tower into an Eco-marvel. Sydney’s ugliest building may soon be getting a new lease on life through to a plan to ‘reskin’ the entire tower with a high-performance photovoltaic skin. Architecture firm Laboratory for Visionary Architecture (LAVA) has proposed the retrofit, and if their plan is enacted it would turn the 1960’s brutalist building into a brilliant super-efficient eco-tower. The University of Technology Sydney Tower has long been known as Sydney’s ugliest building (it even says so on their website). It was built in 1960 and it currently hosts the headquarters of the University. LAVA’s proposed ‘Tower Skin’ concept would wrap the building with a lightweight composite mesh textile. The cocooned shell would then collect rain water, generate electricity and assist the ventilation system in cooling the tower. At night, the skin works as an intelligent media surface that communicates information on events in real time. While this design is only concept, UTS is making extensive renovations on the tower with the goal of improving energy and water efficiency. Unfortunately, it probably won’t look as cool as this one. The concept design is on display at STATE. RESPOND in the Object Gallery in Sydney.